Resisting the water grab. Credit: Edgardo Ayala/IPS. As we enter a new period of Neoliberalism 3.0, the global economic system has become increasingly characterised as one in which natural resources are appropriated for private extraction and gain. These ‘resource grabs’ have seen the transfer of the control and benefits of a resource from communities to powerful, private actors. Ranging from land grabbing for the biofuels industry to the appropriation of the earth’s minerals, such processes push many communities to the peripheries of society, allowing large multi-national corporations to reap the benefits of the resources in question. At the heart of this global process lies freshwater and the dissolution of the already-vague human right to fresh, clean and accessible drinking water. In many parts of the world, local waterscapes have been dramatically transformed through the neoliberal era and its commodification of water. The hydrosocial flow of the resource, already dogged by the battles of gender, class and other power hierarchies, has become dominated by international finance. This is particularly evident in the nation of El Salvador. Despite being the region’s smallest country, El Salvador has the third largest economy in Central America and is the region’s most densely populated country. However it suffers from unprecedented levels of environmental stress and degradation. Even before accounting for the process of water grabbing, access to clean drinking water is a national problem – with demand consistently outpacing supply. An estimated 90% of its surface water is contaminated, and a 2012 survey found that only 69.8% of the nation’s rural households have piped access to water, compared to a figure of 93.5% in the urban areas. In the growing industrial area of Nejapa, located 20km north of the capital, San Salvador, problems of water-stress and restricted access have been exacerbated by the private activity of some of the world’s biggest, most profitable companies. The aquifer beneath Nejapa is one of El Salvador’s largest and is integral to the communities around it, providing an important resource for local farms, towns and a large part of the nearby capital. The largest brewer in El Salvador, Industrias La Constancia (ILC) transferred its bottling operations to the town of Galera Quemada in 1999 – digging two wells into the local aquifer, before being acquired by the world’s second largest brewer SABMiller, (the South African company, based in London, most famous for the Fosters, Grolsch and Peroni brands) in 2005. The operations at the ILC Nejapa plant also include soft-drink bottling operations for Coca Cola. As a result, ILC has become a local subsidiary for both multinational drinks companies. In its operations the company has been accused of over-extracting the resource. A coalition of various social and ecological organisations known as Foro del Agua has stated that almost a third of households in the area have little to no access to water, while local civil society groups have stated that ILC’s actions provide an important example of how competition over limited resources leads to the sad irony of domestic water poverty coexisting with water-intensive industries. The water of Nejapa is being stolen from beneath their feet. Yet, the companies want to expand their interests in Nejapa. ILC requires a third well to increase the supply for its production. As IPS report, this new well would only affect local water supply to the population if the extraction rates exceed 1.1 million cubic metres per year – ILC is planning to go 600 000 cubic metres beyond this figure. This move has caused a public backlash against the company’s operations. Across the nation of a little over six million, a growing movement for water justice is pushing for new legislation to ensure the creation of a hierarchy of water use – prioritising human consumption over industrial and commercial production. 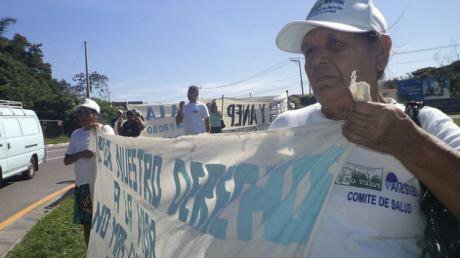 In March of this year, thousands marched on San Salvador to demand such changes. Such pleas have been heard by the leftwing party of the Farabundo Martí National Liberation Front (FMLN) – who, months after winning national elections, reintroduced the bill earlier this year. Whilst the population of Nejapa has faced increasing water scarcity, the companies involved have enjoyed financial success. The culprit on the ground, ILC, reported a 30% growth in revenues in 2012 – without specifying any figures. SABMiller has reported pre-tax profits of US$4.6 billion in 2013 (notable, however, is SABMiller’s ‘difficulties’ with paying such tax). Similarly, Coca Cola returned US$8.5 billion to its shareholders in 2013. Whilst the water of Nejapa is disappearing, its financial benefits are being enjoyed elsewhere. The Supremes once sung that “Things go better with Coke”. Not in Nejapa. However, it is exactly these corporate profits that may make the FMLN’s progressive water law difficult to enforce. An episode currently playing out at a World Bank tribunal provides worrying evidence that El Salvador may not possess the political autonomy over its resources that it desires. In 2002, the Canadian mining company Pacific Rim obtained the legal rights to conduct exploratory work in a search for gold and open the imaginatively-named El Dorado mine in Cabañas, a northern region of El Salvador. Contemporary processes of mining for gold are not as innocent or clean as the romantic version of the panning of the American frontier. Water is used throughout – from processing to transport. Of particular interest is the use of cyanide. This toxic chemical is used to separate the gold from the surrounding rock, soil and other minerals – before seeping into groundwater and aquifer supply. As a result, these processes can have a major impact on local water sources and ecosystems. 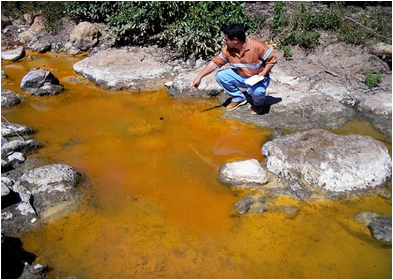 In the region of San Sebastián, where the Commerce Group Corporation had previously been mining for gold, a 2012 government study found nine times the acceptable levels of cyanide and 1,000 times the acceptable levels of iron in the local rivers near the mine. Significantly, Commerce Group Corp. had ceased its operations in the region thirteen years before. In 2006, the Salvadoran government rejected Pacific Rim’s application for a mining permit, due to the company’s failure to fulfil the necessary environmental assessments that are legally required. This was legitimised by public opinion, with the majority (62%) answering “No” when asked if El Salvador was an appropriate nation for such mining activity in a 2007 survey. All subsequent administrations have continued to deny such permits and the newly-elected President Salvador Sánchez Cerén has promised to continue this trend. The company have claimed that the government’s policy represents a rejection of its rights to capital and profits and has invoked judicial proceedings, asking for more than US$300 million – 2% of El Salvador’s total annual GDP – in compensation for spending on the exploration it conducted and for damage to future profits. This case will not be decided in El Salvador, or even Central America, but in Washington, where the World-Bank affiliated International Centre for Settlement of Investment Disputes (ICSID) is based. Pac Rim Cayman LLC v. El Salvador provides further evidence of a growing debate on the balance between corporate rights and impunity and the autonomy and supremacy of the state. This case is not a one-off. The ICSID is currently hearing or has previously ruled on: the London-based Churchill Mining suing the Indonesian government for revoking mining rights; Tullow Oil against the Ugandan decision to place VAT on goods and services that the firm had purchased; and, the tobacco company, Philip Morris suing Uruguay for requiring cigarette packs to display graphic health warnings. However, this case is very different. Pacific Rim is not suing against the confiscation of enterprise or damage to trade – work at El Dorado hadn’t even started. It is demanding for compensation of projected profits from activity that has never actually materialised. Pacific Rim appears to have assumed that the words of Gordon Gekko have become gospel, but many disagree. In April 2014, 300 international and national groups from civil society wrote to the president of the World Bank, Jim Yong Kim, criticising the institution’s role in the Pacific Rim case. At the time of writing over 175,000 had signed a petition against the same case. More significantly, the episode shows that, in a system were corporate power reigns supreme, a nation can be legally challenged for attempting to ensure its population’s right to clean water. In 2002, the UN Committee on Economic, Social and Cultural Rights released a General Comment (No. 15) that explored the human right to water, as a “prerequisite for the realisation of other human rights.” Subsequently, in 2006, the UN Sub-Commission on the Promotion and Protection of Human Rights developed an important list of standards to be met in realising the right to water. These standards provided a framework through which to understand and gauge the human right to water, the state’s failure to meet it and the role of multinational corporations in diluting it in El Salvador. Such measures include both the human right to sufficient water and water that is safe for personal consumption. Would the water near Vasita Escobar’s home be perceived as safe for personal consumption, despite containing dangerously high levels of cyanide pollution? Similarly, would the people of Nejapa, forced to spend up to 15 days without water, feel that their access is sufficient? In the case of El Salvador, the human right to clean water, and the state’s responsibility to provide it, is being questioned and overruled by the deemed importance of projected profits. Greed continues to be good. Events in El Salvador demonstrate that the hope of a universal human right to fresh water is far from secure – the corporate interests of SABMiller, Coca Cola and Pacific Rim continue to enjoy supremacy over the national government’s autonomy and the population’s needs and rights. The case is still pending, ILC is still withdrawing water from beneath Nejapa, and multinational corporations continue to reap the benefits of local communities’ losses across the globe. However, the small country’s efforts to ensure its environmental health and access to clean water will continue to reverberate across the globe.